The current way it´s the phantom BF4 like program that too hard envolving morse codes and all that stuff not every player enjoy! With the Phantom Bow in BF4 the devs create a easy alternative way to get the weapon, and was just pick it up from a box in a especific map! What about do that again with this New Colt Revolver ? Upvote & Share this post guys ! I'm all for doing something to unlock the gun but these code shenanigans are pushing it. I'm all for doing something on to unlock the gun but these code shenanigans is pushing it. Upvote & Share dude! let´s make this happens, before BFV comes and the devs forget about BF1 ! if the community want that Revolver for all that will happens! I dont own a pc,i bought bf1 on console (ps4) and would expect all weapons added to the game to be unlocked using the device i purchased the game on. 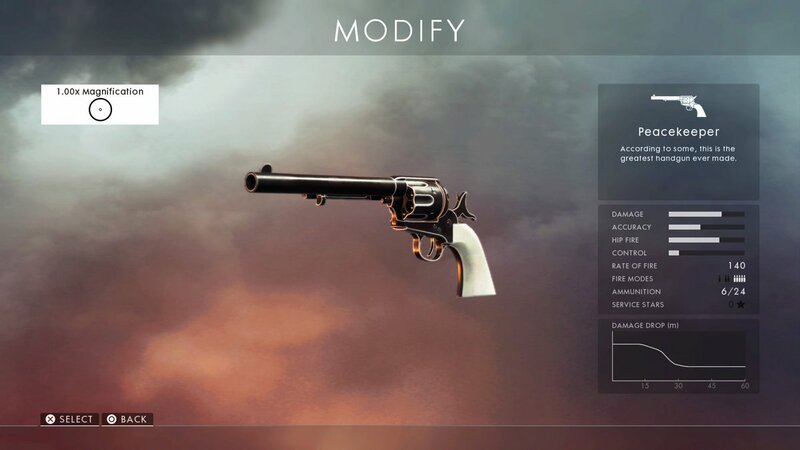 Expecting all console players to use/own a pc and jump through hoops on 3rd party websites in order to figure out morse codes is just taking it too far,seems like dice only had pc players in mind when thinking up these easter eggs. Just the 2 new dogtags and then into the tunnels would have been enough I think. The previous EE dogtags and LMG skin are maybe just too much? I think it should be rewarding for those who went through all the trouble and should therefore remain exclusive. I disagree. I did all the EEs since launch on XB1 ... and some were hard. I am glad I got a nice pistol at the end of the grind. Even more so when its a pistol with 6 rnds and each of those rnds can 1 shot you to the head in cqc. possibly now the best pistol in the game. Really 91%? Turing,einstein and leonardo....they were better than the 91%. Lazy is the correct term here. Certainly not lazy,i do not own a pc,i bought the game on console. Ill ask you this,Did you honestly work out all these easter egg steps by yourself or were you "lazy" and simply watched the youtube video guides like most people? Nobody worked out the easter eggs by themselves. It was a community effort on discord( you should look it up,there's people that might help you completely with the morse,but i doubt with your attitude). Yes i was " lazy", i just followed guides. Was it hard? No? Super long? No,you can do each one in less than 2 hours; it won't take you job/family/dog pooping time away from you,just your regular gaming time. I'd have to agree, all the morse code stuff is a major turn off, the second they started requiring you to tab out of the game to wiki, google or record is pretty much when i stopped EE hunting. I said before a good puzzle should contain itself, another words everything you need to solve it should be in game. "not every player enjoy!" .. hahaha, some guys really want everything on a silver plate. Please keep this unlock and don't give it away for no effort. I'd rather there not be some blatantly cheesy way to get the gun - but I think the tediousness of ALL that morse code you're forced to go through is super unnecessary and too drawn out. It's especially bad for console players that don't have immediate access to a pc and don't know morse code (have to stay in the same server the entire time). I got 3 of the tags you need and the weapon skin, and it still took me a considerable amount of time to decode TWO sequences of morse code because I had to record clips on my xbone, wait for them to upload, and then share them in the BFEE Discord. Then I had to wait for someone to decode mine because 4,000 people were trying to do this. It took hours just to get those few things, at least. Now if I'm not mistaken, one of the other required tags has around 5x the amount of morse code to go through? And again, this is all to get through a maze it'd be perfectly fine getting through if you weren't missing said tags. I said it in another thread, it imo the Peacekeeper isn't worth such a tedious and drawn out set of Easter eggs. The Phantom Bow was a much more unique weapon (and it was a primary with different ammo types! ), and it didn't require nearly as ridiculous an Easter egg. This is more along the lines of "DICE LA Camo" levels of not worth doing. At this point it seems like they're including this ridiculous amount of morse code solely to challenge the small group that's dedicated themselves to figuring the stuff out. Which is a detriment to your average player when THEY want to experience the Easter egg as well, but are stopped in their tracks by randomly generated morse code. It's a neat gun and it'd be fun to play around with, and I'd definitely enjoy having it unlocked - but not if I'm forced to waste time doing a tedious activity I have absolutely zero interest in doing solely because it involves having to perform several out-of-game tasks to complete. I don't want to have to walk back and forth to my pc, and download software I have no other use for just because DICE has some infatuation with morse code. Not for a revolver. Maybe if it were some crazy awesome primary or all-kit primary. Maybe. I agree here. I tried to do all these easter egg dogtags, but at the 5. stage of the "A Beginning" Dogtag, I cannot seem to get my morsecode right. I watched 1000 of videos explaining exactly what to do step by step. I do the same thing and get a Code that isn't even close to anything that he should be, so I can't even assume where I have to go next. This is beyond frustrating. Agreed. And the OP already made this thread in another forum. He/She should go earn it like the rest of us did. We spent many hours to accomplish this. Think of all the work the BFEE community has invested here. This weapon shouldn't be given away for a long time. It needs to remain exclusive to those that put in the effort. My stance is that the Peacekeeper doesn't warrant such tedious and drawn out Easter eggs. If every single Easter egg was required to be done before being rewarded, I expected the reward to be much better. When the first evidence of the Peacekeeper started popping up, I thought it was a fine reward for figuring out you had to have these 2 specific tags and specific weapon skins equipped to make your way through a maze. But there's no way in hell I'm figuring out the rest of those easter eggs for a revolver. Especially when the revolvers most unique characteristic can actually get you killed in a multiplayer match if you're actually trying to use it as a secondary.